1. Amplified electroacoustic pedal harp. 2. Amplified acoustic pedal harp. 3. Unamplified acoustic pedal harp. Period of creation 2014-07-02 to 08-17 and 2014-09-03 to 08 (preparation); 2015-06-09 to 08-17 and 09-21 to 25 and 10-29 to 11-22 (1st version); 2016-08-04 to 10 and 2016-12-18 to 2017-01-08 and 2017-09-15 to 17 (revised version). Commission / occasion 1st version: Commissioned by the harpist Sunniva Rødland (Nor), funded by Norsk kulturråd / Norsk kulturfond (The Arts Council Norway / Norwegian Cultural Fund) (Nor). 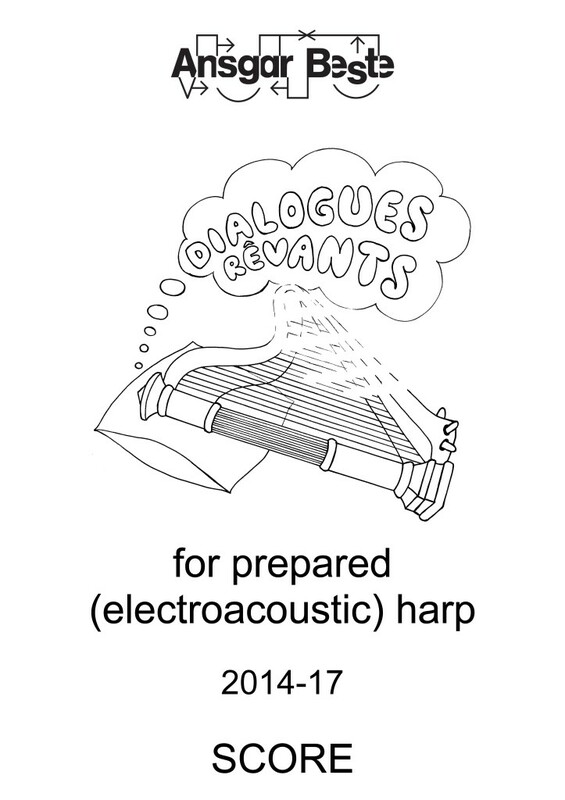 Revised version: Advised by the harpist Alice Belugou (Fra/Sui) for the New Directions Festival 2017 in Piteå (Swe). The main idea behind the piece is the creation of a dialectic dramaturgy within the monophonic limitations of solo music. During the entire duration, two dialogue partners (played by one and the same musician) lead a continuous discussion between two basic and opposite acoustic phenomena: higher pitched sounds, largely produced by the right hand, versus lower, noisy and complex unpitched sounds, mainly generated by the left hand. The pitched process or dialogue partner runs between the binary opposites of stasis and fluidity: The sounds develop from single to repetitive block chords, from chordal to single-note bisbigliandos, from articulated to legato two-note trills to pedal trills, from fluidic trills to fluidic scales, from slow to fast (ordinary) glissandos with increasing density (tremolo), from continuous arpeggios to single virtuoso gestures and finally from repetitive back to single block chords. The unpitched process or dialogue partner proceeds between the poles of attack and resonance: Starting with dry single attacks, the sounds transform to resonant attacks, then to unattacked continuous resonances (i.e. distorted sounds), next to continuous grained resonances with internal, increasingly articulated and dry attacks, thereafter to continuous, dry repetitive scraping, then to chains of dense attacks (sort of unpitched glissandos), before they end up again in dry single grains or attacks. Both processes are evolutionarily consequently autonomous, but structurally constantly interlaced and thus dramaturgically and contrapuntally vividly interacting. This dramaturgical strategy might be compared to the yin and yang from Chinese philosophy: a dynamic system of opposite, but complementary, interconnected and interdependent forces, in which the whole is greater than the assembled parts. A dream is a normally uncontrollable succession of moving (not fixed) visual images, often combined with auditory and bodily sensations, with intense emotions, hallucinated speaking and thought processes. Usually, familiar protagonists (dream figures) are proactively acting in eventful but unfamiliar situations and scenarios, thus mirroring a creative rearrangement of the waking reality, being neither constantly realistic nor particularly surreal or bizarre during the actual experience, whereas a possible felt bizarreness, improbability or even impossibility is typically produced retroactively by the memory. Dreams are generating a large range and a balanced ratio of different positive, negative and neutral emotional qualities: everything from power, joy, peace and love to disgust, shame, anxiety and despair. 2,41% Special distinction at the 6th USAIHC Solo Harp Composition Contest 2018 in Bloomington, IN (USA), hand-picked by Dr. Ruth K. Inglefield, 2/83 (2019-02) [7 min version]. 50% Selection for the Harp Composition Workshop at the 48th International Summer Course for New Music in Darmstadt (Ger), 6/12 (2016-07). duration: 16 min 51 sec. Video editing: Ansgar Beste, 2017-07-24 to 28.